I have a couple hours of free time this morning and like so often happens, I’m crusin’ the cupboards. I know I have a package of chicken breasts in the fridge and I need to use them somehow, but I’m tired of chicken tacos and not up for marinating and grilling on this winter day. So when I open the spice cupboard and see some Penzey’s Hot Curry, well, something–everything just clicks! Place the lentils in a large saucepan and cover with cold water about two inches over the top. Bring to a boil. Reduce heat to a simmer and cook the lentils until tender, about 25 minutes. Set aside. Bring the chicken stock up to a boil in a sauté pan. Reduce the heat and poach the chicken breasts until done, about 6-8 minutes. Remove chicken from the stock and set aside. Reserve the stock for the soup. When the chicken is cool enough to handle, shred or cut into small pieces. Heat the oil in a medium size saucepan over a medium heat. Sauté the onions until tender and translucent, about 10 minutes. Add the curry, ginger, and garlic, and cook for 2-3 minutes longer. Add the reserved chicken stock and coconut milk to the onion mixture. Simmer about 10 minutes. Add the diced tomatoes and lentils and bring to a boil. Add lemon juice and salt and fresh ground cracked pepper to taste. Add the chicken and heat through and serve. Garnish with mint. 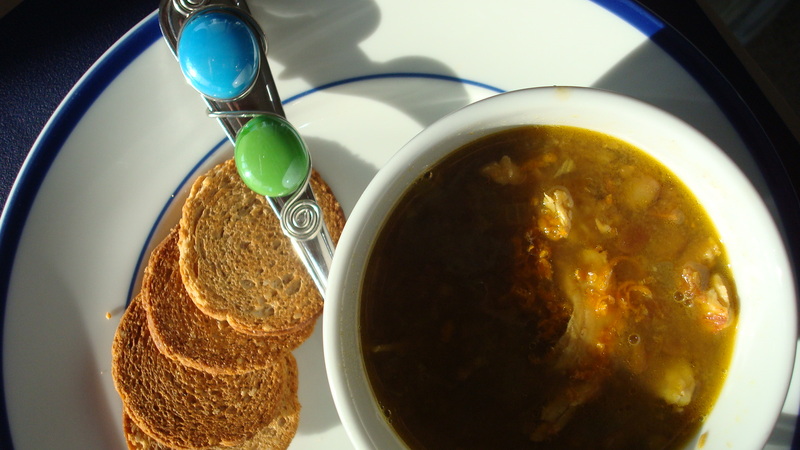 Subscribe to comments with RSS	or TrackBack to 'Curried Chicken and Lentil Soup'. made this tonight. i used sun dried tomatoes for a different flavor. it’s delicious- and will be perfect tomorrow for dinner! thank you! !